Waikato Winter Rugby Camps a huge success. What a wonderful set of camps we had! We had tremendous feedback from players and parents about the quality of the camps, the learnings of those camps, and what their player came away with at all levels. 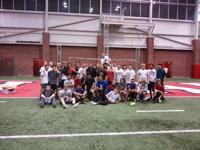 We want to thank Alf Daniels and Rhys Bayliss who took their time to come out to Utah and work with our players. They thought it was great and said on multiple occasions that there was talent here. After the end of the final camp, they actually told us that there are a handful of kids they have seen in the camps that they would take back to NZ in a heartbeat that could quickly play there in their age grades. This is a huge compliment to Utah and feather in the cap of the players they picked out. We will be doing this again. We are already preparing for Winter 2014 to have them come back not to not only work with a camp environment but also directly with teams. Imagine if you could get your teams entire front row, or better yet entire team, working on skills, tactics, and putting that into practice. It’s an incredible opportunity that over 150 kids took part of. Thanks to all the parents, players and coaches who came out and made this a tremendous success…we will see you again soon!